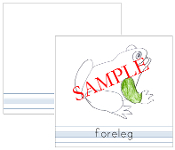 Great for children who like to hand draw nomenclature, flags, vocabulary cards, and art cards. This file is set to print on letter size paper (8½ x 14 inch) and prints 2 blue lined nomenclature papers per printed sheet of paper. Once cut, each blue lined nomenclature paper is 5"x5½".